Liked your review on this. I am actually downloading it…. Will give mine as soon as I am done watching it. 😉 Thanks. Come on David morse is not that scary .. you should watch him in Green mile , i like him . 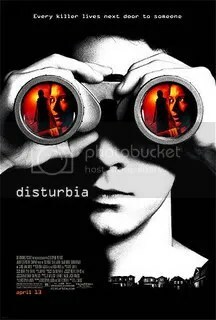 About distubia …cheap imitation of Hitchcocks Rear window , which is a classic master peice … I didnt like disturbia …the hot girl is the only plus point …and OMG what have they done to Kate Moss ? She looks so old ! It’s not a bad movie, but if you are bored and don’t want to watch a moving-teary Drama .. I would say, Go for it…it least it’s entertaining … During the movie, I didn’t check the time every now and then, maybe because I was tired + I wanted to sleep but couldn’t >_<. I’m glad that you liked my humble review .. He is !! Grey, He was so creepy.. I can’t say because I will spoil the story.. But he was!! Green Mile .. It’s been 4 years since I watched that movie .. I don’t remember him in ‘Green Mile’ , so I can’t comment on his role .. Need to re-watch it .. But I need more than 24 hours a day …*___*. It was’t a remake but you got a point .. but it’s a teen movie, so they need ideas from different sources..